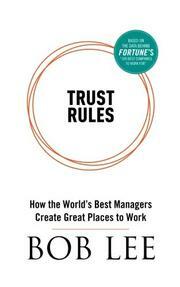 A set of research-based rules for building trust in the workplace. In this debut work, Lee, a senior leader at the Great Place to Work Institute business consultancy, shares his observations about how managers can use trust to create better work environments. This notion is nothing new, but Lee notes that his study of “feedback” from almost 2 million employees in 80 countries has given him a deeper perspective. He found similarities in the ways that employees trusted their bosses, distilled that data, and identified 16 “trust rules” that he says all great managers follow. Lee summarizes these in short, breezy chapters, providing an overview of each rule along with a few relevant examples and suggestions. Individually, the rules, such as “Be Approachable and Easy to Talk To,” “Make Your Expectations Clear,” and “Treat Everyone Fairly,” seem obvious, but taken together, they form a comprehensive checklist, and the author’s practical suggestions are particularly useful. For example, for the rule “Live with Integrity,” Lee enumerates five specific points, including “Be what you want your employees to be” and “Keep a positive and respectful attitude when challenging the status quo.” One chapter asks the important question, “So how can a high-trust manager reconcile the need to achieve results (the reason the organization exists in the first place) with the desire to help employees achieve a reasonable work-life balance?” The author then ably provides the answer by discussing four specific strategies that demonstrate an enlightened, humanistic approach to management. The style in which Lee delivers this material only heightens its usefulness, as he explains each rule in clear, illustrative text. Each rule is reinforced by “Key Points” at the end of each chapter, and each chapter builds upon the previous ones, so that the sum becomes greater than the discrete parts. In closing, Lee offers an engaging 10-step plan for implementing the changes necessary to put these rules into action. A valuable management playbook that reinforces sound practices.